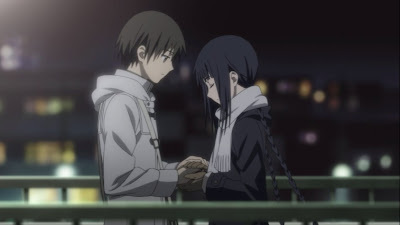 This is a story about a girl named Touko Amano, who can eat and taste books and stories (yes, literally) and Konoha Inoue, a high school boy who used a female's pen name to write a best selling shoujo novel. However, due to an incident, he could no longer write. When I first heard the concept, I thought that she only eats books as some kind of habit, what I wasn't expecting, is the fact they made it clear within the first 10 minutes that she literally could "eat" and "taste" the book, not only by reading it, but actually eating it. But soon, I found out that this is only minor detail that merely serves as the lead-in to the real story. Originally, I thought this is some light drama even light comedy. But then, I realized this is a much darker and more twisted story than I anticipated. The pace of the story is not exactly fast, in fact, it's quite slow by normal standards. But the story itself is so intriguing that I'm completely absorbed in it that the hour and a half passed by like no time. If you have to know, this is a story about love and quest to conquer the darkness in one's heart. I think this is a story that fits a very particular acquired taste, meaning not everybody could appreciate it like me and people alike could as I've seen quite a few reviews online that consider it to be mediocre at best. To me, this is definitely an "A" anime. You have to be able to appreciate not only the sentiment it put you through, but also the contrasting darkness hidden deep within some characters' heart at the same time. I found more often than not, people could accept one or the other, but not both at the same time. That's why I think liking this story would require a very particular acquired taste. Recommendation: Like I said, you may or may not be able to appreciate this story, all depending on your taste. Personally, I would highly recommend this anime movie. And OVA is not the one I'm talking about in the post, it's the actual movie. OVAs are just prequels to the actual story.